We recommend using the Appliance Management Interface to submit appliance logs directly to the AeroFS Support team or download them to your computer. If you are unable to access that interface, download logs using one of the other two methods listed below. Go to the Appliance Management Interface and click on Collect logs. If you could not complete appliance setup and create a user account, you can access this page by pointing your browser to http://<your_appliance_hostname>/admin/collect_logs. From this page, submit your logs directly to AeroFS Support servers by entering a description of the problem and clicking Submit appliance logs. Alternatively, you can download appliance logs to your computer and submit them to AeroFS Support manually. If you deployed the AeroFS appliance using a hypervisor, you can download appliance logs at the virtual machine console. At the console prompt, select option 5 as shown in the image below. Then point your browser to http://<appliance_ip_address>:8080 to download the logs. 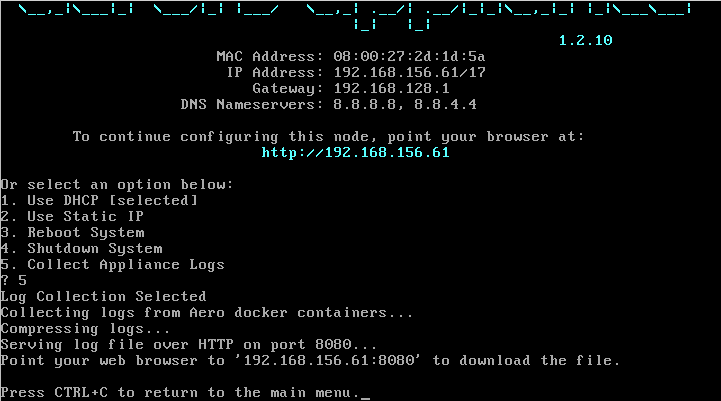 If you deployed the AeroFS appliance using Docker or EC2, you can download appliance logs using command line tools. Follow the steps outlined on our Collect Logs GitHub page.